Resistors are supplied for both AC & DC requirements. the besic types of resistors are stainless steel wire and punched steel. Suitable for current rating 10 to 800 amps. Multiple paths are used for system hving higher ratings. 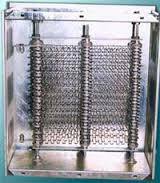 These resistors consist of stainless steel wires or strimp form of grids. The standard modules with current rating from 7 Amps to 400 Amps Single or multiples options are available. Punched grid resistors consist of grids punched from sheet of correction resistant nickel chromium alloy sheet steels. The punched steel grids are veryrobus with no effect of jerks, Shocks or vibration. Ideal for heavy operating conditions like steel mill application. Available in current rating 8 Amps to 800 Amps.